Summer is by far the best time of year for exploring your local meadow. Now wildflowers are blooming, butterflies are on the wing, grasshoppers are singing and birds are raising young. In most of the UK, meadows came about through people felling forests thousands of years ago, and subsequently grazing livestock over many centuries. Meadows are a habitat maintained – and prevented from becoming something else – by the activity of humans and our livestock. Since these habitats were largely shaped by centuries of grazing, conservation organisations continue the same management today. It is only through management of scrub and trees that we can maintain the open diversity of these wonderful habitats. Meadows are therefore also great places to look out for our native livestock species. 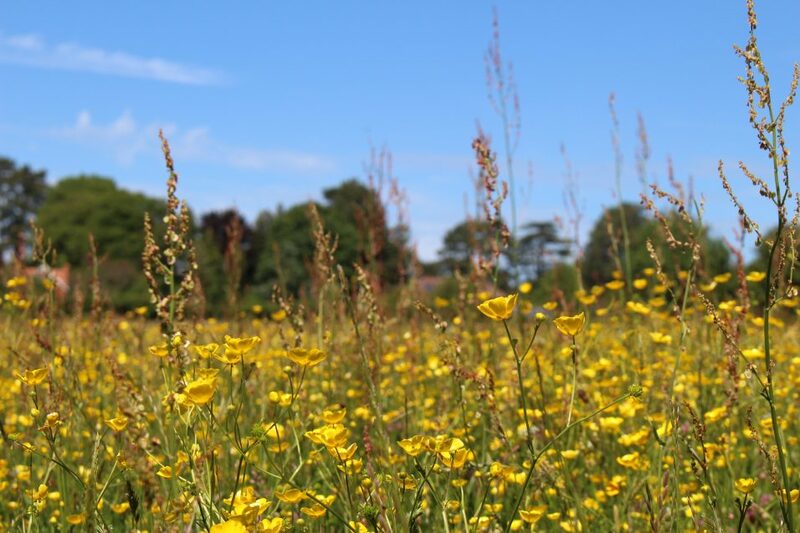 The Wildlife Trust’s management of meadows is supported by an army of cows and sheep, who keep the scrub at bay, and maintain the open habitat that sun-loving flowers and invertebrates love. Male skylarks sing in flight as well as from perches such as fence posts or large rocks. Despite their aerial activities, skylarks nest on the ground, laying three to four eggs. If seen singing, the Skylark is unmistakeable. A streaky brown bird with a crest, the skylark is larger, with a longer tail, than other similar birds. The song of the skylark has been the subject of many works of literature and music, from Chaucer to Shelley, Vaughan Williams to jazz. Grasshoppers can be found thanks to the males’ song, created by rubbing their legs against their wings. Field grasshoppers are one of our commonest species, and their song is a brief, single chirrup, repeated at short intervals. The meadow brown is one of the commonest grassland butterflies, though whole colonies have been lost as a result of agricultural practices in recent years. They can be seen from June to September. – look out for mainly brown butterflies with washed-out orange patches on the forewings.